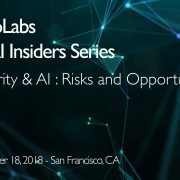 Join thought leaders leveraging AI applications to build the future of enterprise, corporations, governments, and society as we know it. 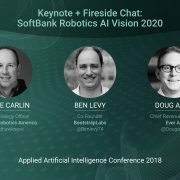 During this session, the speakers discussed AI in robotics, and where SoftBank sees the future going in the next few years, some of the key challenges in hospitality and how companies can partner with SoftBank and the 2020 Vision. Contextualizing data is going to be a key differentiator in AI technologies moving forward like conversational UX and deciphering customer intent. Robotics has the capability to disrupt the key revenue-driving experience for over 20 trillion dollar industry. Be hyper focused in the use cases your technology will be able to solve instead of covering a wide range. Steve Carlin leads SoftBank Robotics America and is the global Chief Strategy Officer. In this role, he acts as the General Manager for the Americas region and oversees global marketing, product and strategy. Carlin most recently came from Facebook where he held the role of Global Head of Strategy – Gaming. Prior to Facebook, Carlin was the Senior Director of Marketing and Insights for Ubisoft. He also held a series of roles in sales, shopper marketing, brand management, and strategy at Energizer and Procter & Gamble. He holds a BA in Geology from Miami University in Oxford, Ohio, and an MBA in Marketing and International Business from Goizueta Business School. He has also studied at Cornell, HEC business school in Paris and the UIBE business school in Beijing. Ben is a Co-founder and Partner at BootstrapLabs, a leading Venture Capital firm based in Silicon Valley and focused on Applied Artificial Intelligence. Prior to BootstrapLabs, Ben was repeat entrepreneur who launched, built, and exited two startups in the financial technology space, Praedea Solution and InsideVenture. He also was a Technology, Media, and Telecom Investment Banker who advised startup founders and CxOs of Fortune 500 companies on corporate strategy, financing, and M&A. Over a period of 10 years, Ben helped his clients raise over $300M from institutional investors and close over $5B in M&A transactions. Ben is a frequent keynote and panel speaker on innovation, technology investing, entrepreneurship, artificial intelligence, and globalization in the US, Europe, and Asia. Doug Aley has spent his career helping to found, lead, and scale startups. He is currently Ever AI’s CRO and a principal at Atomic Ventures. Prior to Ever AI, he held positions early in his career at Amazon, was VP of Marketing, Product, and Business development at Jott Networks, helped Zulily scale from $100M to $700M as VP of Product and Corporate Development, held the same role at Room77, and started and led Minted’s digital growth team. Mr. Aley holds a BA from Stanford University and an MBA from Harvard Business School, and lives in Greenbrae, CA with his wife, Susan, and their two boys. Over the next several weeks we’ll be releasing the videos from the sessions from the BootstrapLabs Applied AI Conference 2018. The yearly conference organized by BootstrapLabs, a leading Venture Capital firm focused on Applied AI, that brings together over 800 members of the Artificial Intelligence community for a day of incredible speakers and exciting conversations. A limited number of tickets are currently on sale at the Early Bird price ($1040 off) ENDING MARCH 15TH! During this session, the panelists discussed AI in the context of regulation, the role of government in fostering and leveraging emerging technologies and the reasons why we need better public/private collaboration. Fostering and creating explainable models is going to be crucial to get government support and foster collaboration in the AI space. Standards, certification, protocols, partnerships and process or outcomes based scalable laws are some of the avenues we need to explore to “regulate” AI. Open, honest conversations are necessary between technology companies and regulators, it’s important to educate them on how the technology works and the real risks with integrating to different systems. Jane Macfarlane is the CEO of Seurat Labs and is also the Director of Smart Cities and Sustainable Mobility at the University of California at Berkeley. Dr. Macfarlane has over 30 years of experience in high performance computing, data analytics and geospatial mapping. She has held various roles responsible for directing industry research groups including: Chief Scientist and Head of Research for HERE, VP of Process Engineering at Imara, and Director of Advanced Technology Planning for OnStar at General Motors. She has authored 26 patents, primarily in geospatial data analytics. She holds a Ph.D. in Mechanical Engineering from the University of Minnesota. Currently she is leading a DOE National Laboratory effort focused on the use of High Performance Computing to address Big Data Issues in transportation systems. 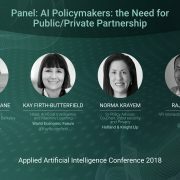 Kay Firth-Butterfield is the Head of AI & ML at the World Economic Forum and is a Barrister-at-Law and former part-time Judge in the UK. She is an Associate Fellow of the Centre for the Future of Intelligence at Cambridge and Fellow of the Robert E. Strauss Center on international Security and Law at the University of Texas. She is Vice-Chair of the IEEE Initiative on Ethical Considerations in AI and Autonomous Systems. She is one of Robohub’s top 25 Women in Robotics and co-founded AI-Austin, AI-Global and the Consortium for Law and Policy of AI and Robotics. Norma Krayem is a Senior Policy Advisor and Co-Chair of the Holland & Knight Global Cybersecurity and Privacy Team. She brings more than 20 years of experience within the global policy-making arena including executive-level positions in the U.S. Departments of State, Commerce and Transportation, and as a consultant at the Federal Emergency Management Agency (FEMA). She works on a daily basis with the White House, Executive Branch and Congress on a host of matters, including Homeland Security, Commerce, Defense, Treasury, Transportation among others. She is a member of The Chatham House and served on the prestigious CSIS Cybersecurity Task Force from 2015-2017. Raj Minhas is Vice President and Director of the Interactions and Analytics Lab (IAL) at PARC. Research in IAL focuses on people and their behaviors. Raj joined PARC in September 2013 as the Program Manager for Prognostics and Health Management and was responsible for the strategy and execution for the commercialization of the related technologies. Prior to PARC, he was the Director of Xerox Research Center India where he led its growth, development, and outreach for two years. Raj earned his Ph.D. and M.S. in Electrical and Computer Engineering from University of Toronto and B.E. from Delhi University. He has eight patents and six pending patent applications. 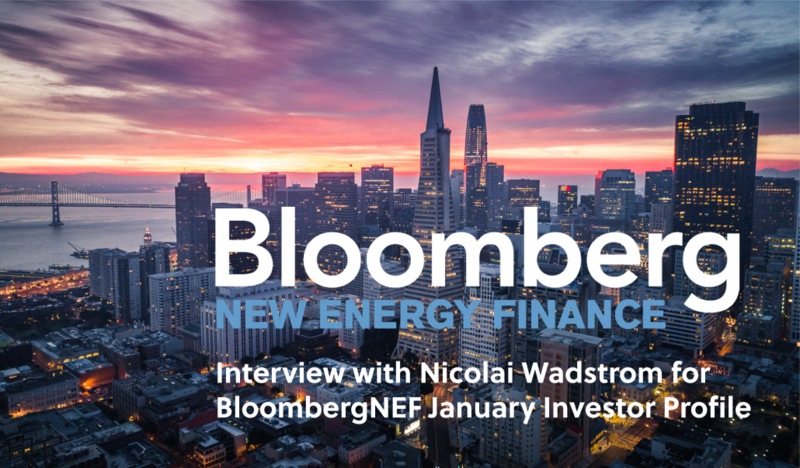 In December 2018, our CEO and Founder, Nicolai Wadstrom, met with Danya Liu, Emerging Technology Analyst at Bloomberg NEF in San Francisco. He shared some details about the BootstrapLabs investment strategy, and his vision on how Artificial Intelligence will impact our world. Each month Bloomberg features a strategic investor active in one of the key industries they track. Their profiles provide an outline of the main investors, portfolio companies, characteristics, and strategies involved in the company, as well as their own opinion on what makes their operation so interesting. 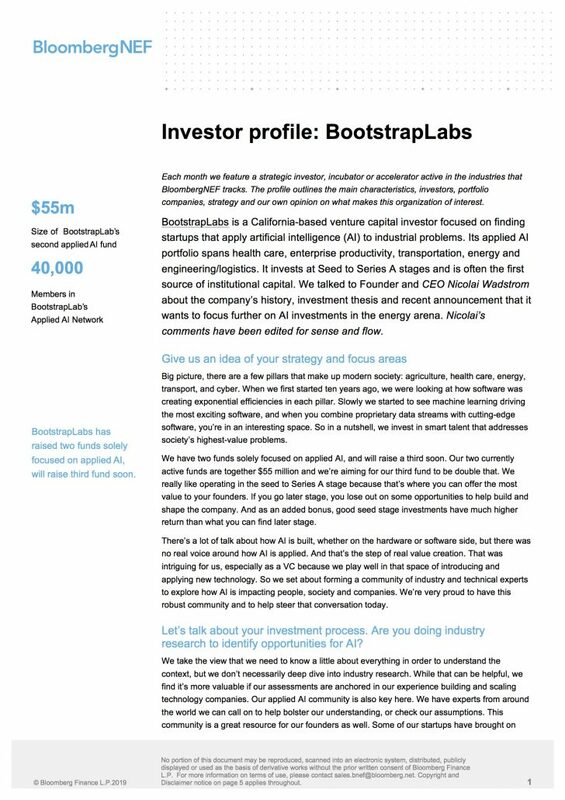 We are pleased to share with our community the first Bloomberg Tech Radar report of 2019, featuring BootstrapLabs. You can access a copy of the report (courtesy of BloombergNEF) by clicking on this link or the image below, and entering your email address. During this session, the speakers discussed the future of computing in the age of AI, Neuromorphic and Quantum computing and edge use cases and applications. The death of Moore’s Law as originally define has given birth to a variety of them depending on the technology leveraged: neuromorphic, quantum, among others. There’s a shift in the industry from bigger companies to focus on creating their own use-case-specific chip architecture. We need to bring more power to edge computing to really provide AI solutions that work and leverage insights in real time. Thomas A. Campbell, Ph.D.is the founder and president of FutureGrasp, which advises organizations on trends and impact of emerging technologies, and a special advisor to BootstrapLabs. Prior to this, Tom was the first National Intelligence Officer for Technology with the National Intelligence Council. Tom holds a Ph.D. in Aerospace Engineering Sciences from the University of Colorado at Boulder, and a B.E. in Mechanical Engineering from Vanderbilt University. Madhav Thattai is the COO of Rigetti Computing, a full-stack quantum computing company based in Berkeley, California. Prior to joining Rigetti in 2015, Madhav worked at Dell Computing for eight years in a variety of roles, most recently as Director of Product Operations. Madhav holds a Master’s degree in management from Stanford University, a Master’s degree in industrial engineering from the University of Michigan, and a Bachelor’s degree in mechanical engineering from Birla Institute of Technology and Science in India. Sateesh is the Founder and CEO of Pathtronic Inc, a silicon valley start-up company focused on building revolutionary AI Processing Unit. Sateesh is a visionary and seasoned entrepreneurial executive and innovator with broad technology background. He has been advisor to multiple corporations, start-ups, incubators, and universities in the area of AI, Autonomous Vehicles and Drones, and more. As a former innovation and incubation executive at Cisco, he pioneered and led various initiatives in the area of IOT, Automotive and Connected Vehicles, Industrial Switching and Automation, Smart Cities, Mobile and Wireless, Fog Computing, Big Data and Machine Learning and more. Prior to Cisco, he founded and led multiple Silicon Valley venture funded start-ups. He has published extensively in international journals including IEEE/ACM and holds dozens of granted patents. 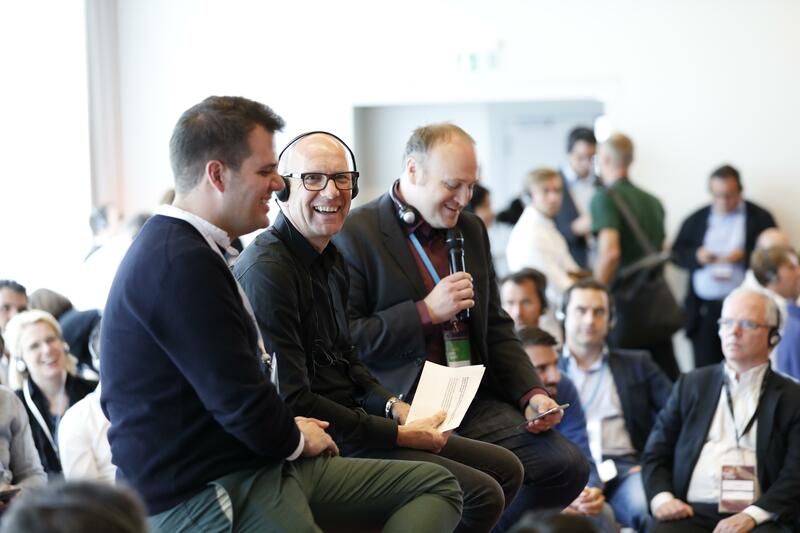 Berlin, Germany – October 4, 2018 – Nicolai Wadstrom, BootstrapLabs Founder, CEO and Managing Partner, was recently invited by innogy Innovation Hub to participate in the fourth annual “UnConference” as a panelist to discuss digital disruption, Applied Artificial Intelligence, and the impact of technology on the Energy space. 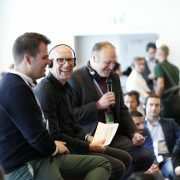 During the Disruption Platform session moderated by Thomas Birr, SVP of Innovation & Business Transformation at innogy and CEO of innogy Innovation Hub, Nicolai and Tim Kock, Co-Founder at Jungle AI, weighed in on the challenges and opportunities presented by emerging technologies and their potential impact on the decentralized energy system of the future. As leaders in the AI space, both Nicolai and Tim were asked to speak about why the unique combination of AI + Energy is so interesting, as well as subtechnologies that have the most potential to disrupt the traditional energy industry. UnConference by innogy Innovation Hub provides a platform for innovators, startups, VCs, thought leaders, and experts to come together and jointly create the future of energy. 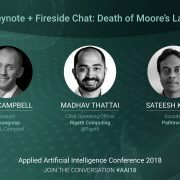 WANT TO JOIN US AT THE NEXT AI EVENT? Sign up for our newsletter to receive updates – subscribe here. The energy systems of the future will be too complex to be managed by people and this is precisely where AI comes in. 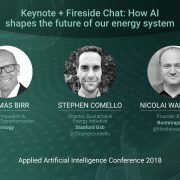 In this Keynote and Fireside Chat, Thomas Birr, Stephen Comello, and Nicolai Wadstrom discuss the impact of Artificial Intelligence on energy systems by activating AI and powering the electrical grids of the future, AI will help to make energy safer, more reliable, and customer service oriented. During this session, the speakers discussed the future of our energy system, how production and usage will evolve over time, and how we will leverage AI to manage, predict, and optimize energy. By leveraging customer habit data with AI and algorithms, the grid will be able to optimize when/where/how to distribute energy. The future of the grid lies in micro dimension, with multiple micro-grids and connected devices that will self-optimize and make economic decisions without human interaction. Thomas is the SVP of Innovation & Business Transformation at innogy SE and CEO of the innogy Innovation Hub, a leading European utility whose mission is to create a future beyond the traditional energy business. He leads innogy’s Innovation Hub, which is now building and co-creating new digital and platform-powered business models in partnership with the world’s most promising start-ups. Thomas is a strong believer that AI will change every industry – including Energy. Dr. Comello is the director of the Sustainable Energy Initiative at Stanford Graduate School of Business and a founding member of the Bits & Watts Initiative within Stanford’s Precourt Institute for Energy. His work examines the organization of innovation and how technology and policy co-evolve to influence the economic attractiveness of advanced energy solutions. Nicolai is the Founder and CEO of BootstrapLabs, a leading Venture Capital firm based in Silicon Valley and focused on Applied Artificial Intelligence. Throughout his career he has been very focused on product and technology development within Machine Learning, Big Data, Analytics, Internet, Mobile and Software/Cloud sectors. Prior to BootstrapLabs he was a multiple-time startup CEO and CTO. He has raised capital from Angels, Private Equity, Investment Banks and VC’s. Nicolai is a frequent guest speaker, mentor and judge at Universities and Conferences in the US and Europe. The BootstrapLabs Applied AI Conference is a yearly conference organized by BootstrapLabs, a leading Venture Capital firm focused on Applied AI. The annual event brings together over 800 members of the Artificial Intelligence community for a day of incredible speakers and exciting conversations. The community is comprised of founders and executives who are experts in the field of Applied Artificial Intelligence, veteran technologists leading the world’s most innovative organizations, and key partners in the AI ecosystem sharing deep-domain knowledge within specific verticals. If you would like to attend the BootstrapLabs Applied Artificial Intelligence Conference 2019, tickets are now available! Human assisted AI is changing industrial and manufacturing – what are the applications and use cases we should pay attention to? 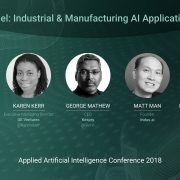 In this panel conversation at BootstrapLabs Applied AI Conference, Macario Namie discusses Industry 4.0 with leaders from GE, Kespry, Indus.ai and Foghorn Systems. Discover how AI and human assisted autonomy provide better utility in manufacturing and industrial work flows and why its important. Learn about new processes in construction, insurance, mining, and off-shore oil drilling that leverage AI and have the potential to lower costs and increase revenue. During this session, the panelists discussed AI in manufacturing and industrial applications, the need to combine domain expertise with algorithms, and getting actionable insights from your data in real time. For AI to deliver value in industrial applications you really need to have domain expertise and understand the particular workflows of the industry you’re serving. Clients in the industrial space aren’t looking to replace the human component, they’re looking for human-assisted solutions that will augment people with AI. You need to demonstrate how technology will translate into ROI. These companies have been burned in the past by following a technology fad, so you need to show how AI can have an operational impact today. Macario Namie joined Jasper in 2007 and – after Cisco’s acquisition of Jasper in 2016 – now leads IoT strategy efforts, including ecosystem development, for Cisco. Prior to this role, Macario spent 8 years leading marketing for Jasper, responsible for product marketing, corporate marketing, field marketing, and demand generation. Macario brings nearly 20 years in marketing Software-as-a-Service enterprise applications. Prior to Jasper, Macario led Worldwide Product Marketing at WebEx, where he was responsible for solution definition and execution of go-to-market plans for the entire WebEx product portfolio. Macario also held senior roles at ePeople and Lycos and holds a B.A. from the University of California, Berkeley. Karen Kerr leads a team focused on making investments and partnerships in the advanced manufacturing ecosystem. Karen comes to GE with two decades of experience in developing technology based businesses and venture investing. Previously she served as Senior Director of New Ventures and Alliances at the University of Southern California (USC) Stevens Center for Innovation. Before joining USC, Karen led business development at Intellectual Ventures, was Managing Director at ARCH Venture Partners, and founded Agile Equities LLC. Karen was named one of LA’s Top Innovators in 2012 by C Suite Quarterly, selected to C200 leading business women in 2004, and selected by Crain’s Chicago Business for its 40 under 40 list of leading business professionals in Chicago. Karen earned a PhD in Physical Chemistry from the University of Chicago and an AB in Chemistry from Bryn Mawr College. provider. At Kespry, he focuses on leading the company’s mission to transform how people and businesses capture, use and get value from worksite intelligence. Prior to Kespry, George held senior leadership positions at Alteryx, salesforce.com and SAP. He holds a BS in Neurobiology from Cornell University and an MBA from Duke University, where he was a Fuqua Scholar. Matt Man is the founder of indus.ai, a video analytics and big data product for construction sites. In Matt’s previous life he founded a mobile application development firm GreenOwl Mobile which deployed 45+ smart city apps across 5 countries. He is an experienced SaaS founder who understands the enterprise B2B market. He holds a Masters in Engineering from Stanford, and BASc in Engineer Science from the University of Toronto. He started experimenting with AI during his undergraduate years, where he coded his first neural network to translate sign language. Ramya heads Product Management at FogHorn. She is seasoned leader in emerging markets, with a track record of creating value. She brings a rare combination of technical expertise in real time analytics, machine learning, AI, and valuable experience in Industrial IOT. Ramya has a PhD in Computer Science from Virginia Tech. The BootstrapLabs Applied AI Conference 2018 is a yearly conference organized by BootstrapLabs, a leading Venture Capital firm focused on Applied AI. The annual event brings together over 800 members of the Artificial Intelligence community for a day of incredible speakers and exciting conversations. The community is comprised of founders and executives who are experts in the field of applied artificial intelligence, veteran technologists leading the world’s most innovative organizations and key partners in the AI ecosphere sharing deep-domain knowledge within specific verticals. Registration: This event is INVITE ONLY. If you did not receive an invitation you can request one below. We stand in front of the 4th and largest wave of the industrial revolution, powered by AI and Data. This is the biggest opportunity, so far, for innovation and entrepreneurship, and every single industry will be disrupted and redefined by companies that are not yet even born. With the AI market projected to grow over 20 fold in the next 10 years to $3 Trillion annually, we believe Applied Artificial Intelligence represents one of the major wealth creation opportunities of this century. US organizations will soon be spending over $100 billion per year in cybersecurity, a number that is expected to grow significantly given the massive adoption of cloud computing, the number of connected devices, and the increase in cybercrime activities. While cybersecurity startups have raised ~ $4.2 billion in VC funding, the need for data privacy and protection grows. As does the need for secure intelligent communication networks, fast reliable authentication, fail-safe and redundancy planning, and certified/established regulatory systems. The future of cybersecurity offers many risks, but also business opportunities enabled by applying artificial intelligence to protect people, operations, organizations, and nation states. 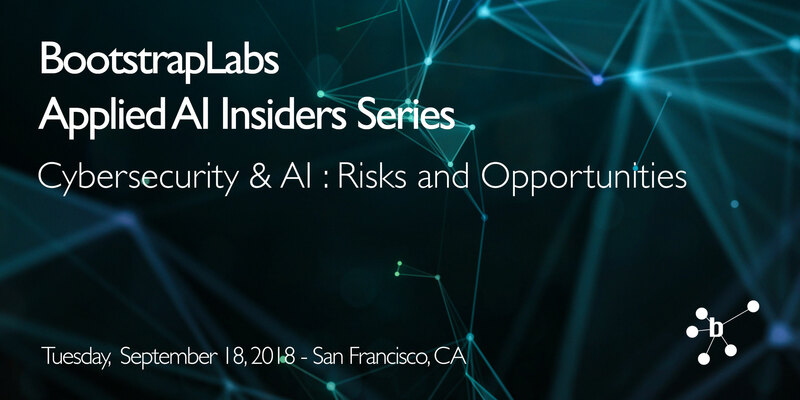 Join us for an evening of multi-dimensional discussion related to the intersection of AI and Cybersecurity. John Apostolopoulos is VP/CTO of Cisco’s Enterprise Networking Business (Cisco’s largest business) where he drives the technology and architecture direction in strategic areas for the business. This covers the broad Cisco portfolio including Intent-Based Networking (IBN), Internet of Things (IoT), wireless (ranging from Wi-Fi to emerging 5G), application-aware networking, multimedia networking, indoor-location-based services, connected car, machine learning and AI applied to the aforementioned areas, and deep learning for visual analytics. Previously, John was Lab Director for the Mobile & Immersive Experience Lab at HP Labs. The MIX Lab conducted research on novel mobile devices and sensing, mobile client/cloud multimedia computing, immersive environments, video & audio signal processing, computer vision & graphics, multimedia networking, glasses-free 3D, next-generation plastic displays, wireless, and user experience design. Erin Kenneally is currently serving out her role as Program Manager in the Cyber Security Division for the U.S. Dept of Homeland Security, Science & Technology Directorate. Her portfolio comprises cybersecurity research infrastructure, privacy, cyber risk economics, and technology ethics. She manages the IMPACT (Information Marketplace for Policy and Analysis of Cyber-risk and Trust), CYRIE (Cyber Risk Economics), and Data Privacy programs. Kenneally is Founder and CEO of Elchemy, Inc., and served as Technology-Law Specialist at the International Computer Science Institute (ICSI) and the Center for Internet Data Analysis (CAIDA) and Center for Evidence-based Security Research (CESR) at the University of California, San Diego. Erin is a licensed Attorney specializing in information technology law, including privacy technology, data protection, artificial intelligence ethics and legal risk, trusted information sharing, technology policy, cybercrime, data ethics, and emergent IT legal risks. She holds Juris Doctorate and Masters of Forensic Sciences degrees and is a graduate of Syracuse University and The George Washington University. Chris has over 30 years’ experience in information security. He led the build for eight Fortune-50 SOCs and created the blueprint deployed by the ArcSight solutions team at over 45 security operations centers. He has served as HP’s WW Director of Solutions Innovation, CEO of Laconic Security, Director of Services for Cybertrust, and Manager of Security Intelligence and Operations for IBM’s MSS. Chris also spent 14 years in the National Defense and Intelligence community in the field of Information Operations and 10 years in the U.S. Army in Military Intelligence and Special Forces. Today, Chris is Co-Founder and VP of Product Strategy at Respond Software, inventors of the exclusive Self-Driving SOC. The goal of autonomous mobility is to impact communities by creating safer and less congested cities but there technological limitations business must overcome before this future becomes reality. Learn how some of the industry’s leading minds prioritize infrastructure, public safety, compute and AI. At BootstrapLabs Applied Artificial Intelligence 2018 Conference, Evangelos Simoudis, Founder and Managing Director of Synapse Partners, explores the future of mobility with industry leaders John Absmeier, Head of Autonomous Mobility from Samsung and Nadeem Sheikh, VP of Self Driving Programs from Lyft. If you want to check out the slides used by the speaker follow this link. The biggest impact autonomous driving will have long term isn’t in business, but safety. Processes, standards, education and better computation power are all necessary to make autonomous driving a reality. Sensors capabilities with higher resolution and speed of data are some of the challenges we need to address; humans still have a better response time in some autonomous driving scenarios because of this. Evangelos is the co-founder and managing director of Synapse Partners, a firm that invests in early-stage companies developing applications that combine AI with Big Data. He is an author, a member of numerous advisory boards, and has more than 20 years experience working in various high-tech industries. Evangelos earned a Ph.D. in computer science from Brandeis University and a B.S. in electrical engineering from Caltech. John Absmeier is the SVP of the Autonomous/ADAS strategic business unit and VP of Smart Machines for HARMAN and Samsung. Absmeier is a self-proclaimed geek, gearhead and jarhead with 20 years’ experience in the automotive industry. He founded Delphi Labs @ Silicon Valley and led the team to develop Delphi’s autonomous vehicle platform. Absmeier has a BSME from Purdue University, MSME from UC Berkeley, and executive MBAs from UC Berkeley,, University of Michigan, and Thunderbird. Nadeem is the VP of Self-Driving Vehicle Programs at Lyft, where he is responsible for Lyft’s roadmap for scaling self-driving technology. Prior to Lyft, Nadeem was part of the executive team at Opower, an energy-focused software company which went public in 2014. Nadeem was a consultant at McKinsey, where he worked in the Automotive sector and helped found the Sustainability Practice. He earned his MBA from UC Berkeley and his BS in Industrial Engineering from the University of Wisconsin-Madison. Paul Daugherty shares his vision of reimagining the Future of Work while on stage at BootstrapLabs Applied AI Conference. Paul Daugherty is the Chief Technology & Innovation Officer at Accenture and leads the company’s Technology Innovation & Ecosystem group. In addition to overseeing Accenture’s technology strategy, Mr. Daugherty is responsible for driving innovation through R&D activities within Accenture Labs. While he manages Accenture’s alliances, partnerships and senior-level relationships he works to leverage emerging technologies and bring the newest innovation to his clients globally. During this session, Paul Daugherty discusses the Future of Work (FofW), AI as the alpha trend in technology, the distribution of labor between humans and machines and how to prepare people and businesses for the impact of artificial intelligence. AI is the Alpha Trend in technology because it fundamentally influences the way other technology trends develop. AI is poised to be the biggest thing that impacts our lifetime. Executives need to fundamentally approach their business differently to gain value from AI; this means creating processes that are dynamic, personalized, flexible and adaptive. The future is will depend on a Human + Machine relationship. Giving people the right machine counterparts for working together to achieve higher levels of intelligence and increased collaborative intelligence.